My son Aarav has been saying this over and over and over again for the past three weeks. He loves doughnuts, the big greasy sugared blobs sold in the famous doughnut chains. For him, it’s a rare indulgence as I have limited this artery clogging treat to just one or two a month (unless my husband decides to break the rules – which he does once in a while). 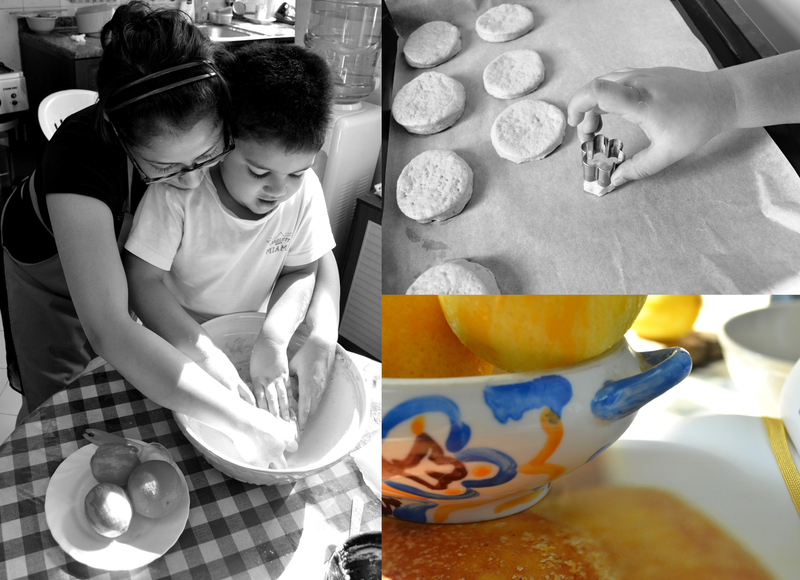 This weekend I decided to take ‘Make doughnuts with mummy’ off Aarav’s wish list. It was a cold rainy day – a rare occurrence in this part of the world – and piping hot doughnuts with a steaming cup of coffee seemed just the right thing to complement the weather. 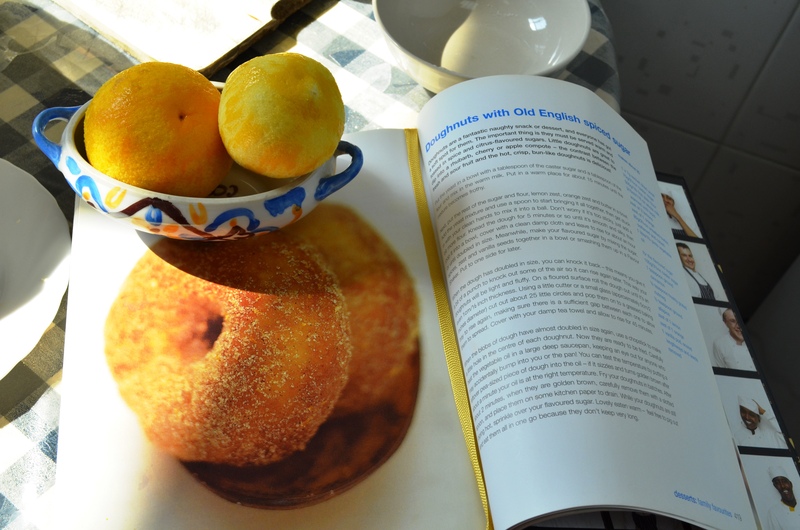 Armed with Jamie Oliver’s Cook with Jamie and a mountain of cooking utensils (I am a one-bowl-dish kind of gal) I braved the kitchen with my five year old in tow to make Doughnuts with Old English spiced sugar. It was smooth sailing from start to finish. The recipe had easy to follow steps and Aarav helped me with all the stirring, kneading and rolling. He got quite impatient each time we had to take a break – 15 minutes for the yeast to work through and 1 hour for the dough to rise… (you can use this time to prepare the spiced sugar). 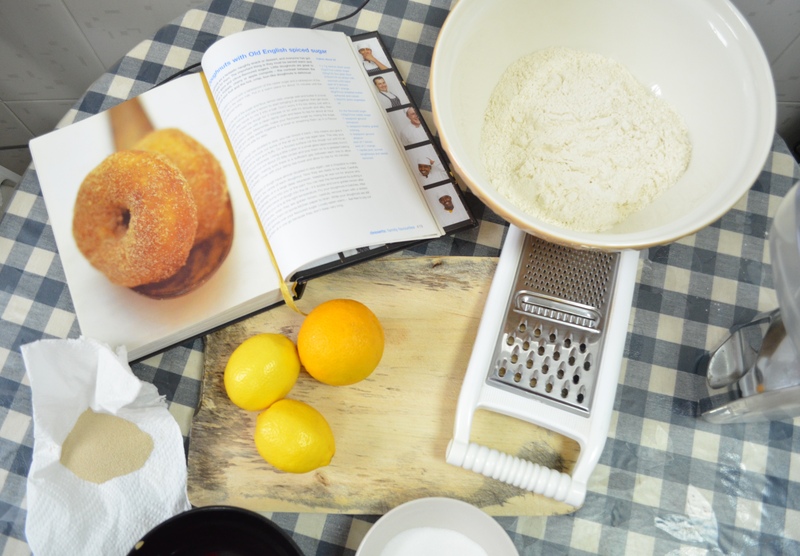 After much mixing, waiting, kneading, rolling and poking little holes in the doughnuts with a chopstick (a brilliant idea – I love Jamie’s no-nonsense approach to food – avoid if you want fried doughnut holes) it was time to fry these babies. They came out of the frying pan golden and puffy ready to be rolled in the Old English spiced sugar. You need to do this while they are still piping hot. Et voilà! 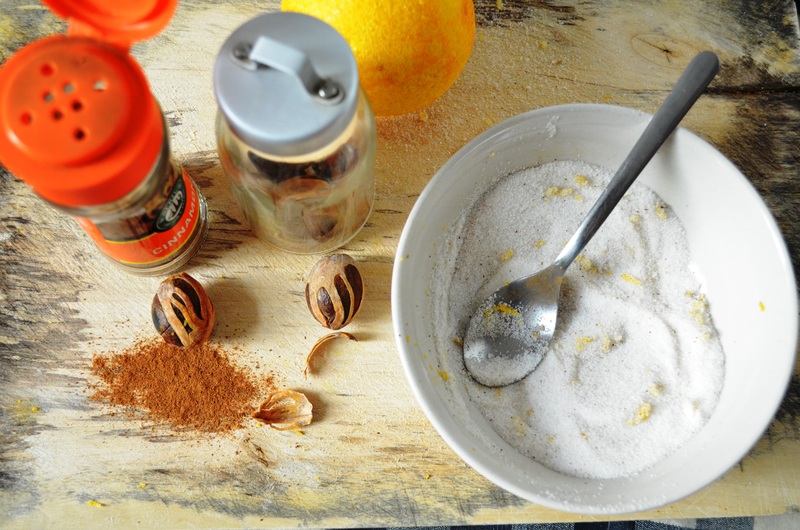 What sets these apart from the ordinary doughnut is the lemon and orange zest you add to the dough which gives it a sophisticated zing and the spiced sugar with subtle hints of vanilla, cinnamon and nutmeg. However I found these a bit bland. I believe it is because there is no salt added to the dough (even the butter is unsalted). If I were to make these again I would add half a teaspoon of salt or replace the unsalted butter with salted. Did Aarav like these? Sadly, no. I guess they were too sophisticated for his baby taste buds. Note: I rate all the recipes I try by drawing smileys on them, so whenever I feel like cooking something I know which ones to pick. 🙂 🙂 = Great! Will make often 🙂 = Good, worth making again 😐 = Confused 😦 = Bin it! 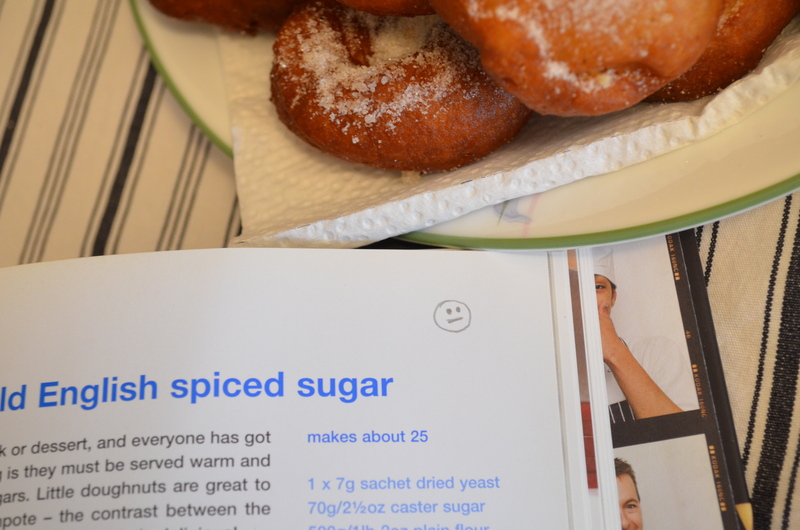 So what did Jamie Oliver’s spiced doughnuts get? Put the yeast in a bowl with a tablespoon of the caster sugar and a tablespoon of the flour and mix in the warm milk. Put in a warm place for about 15 minutes until the mixture becomes frothy. 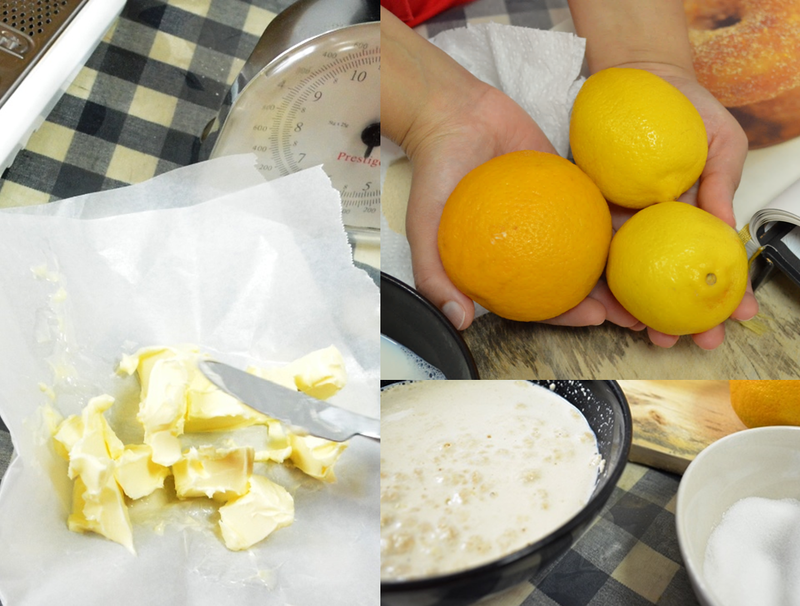 Next, put the rest of the sugar and flour, lemon/orange zest, salt and butter in a bowl. Add the yeast mixture and use a spoon to start bringing it all together, then use your hands to mix it into a ball. If it’s too sticky add a bit more flour. Knead the dough for 5 minutes until it’s smooth and silky, then put in a bowl, cover with a clean damp cloth and leave to rise for about an hour or until doubled in size. 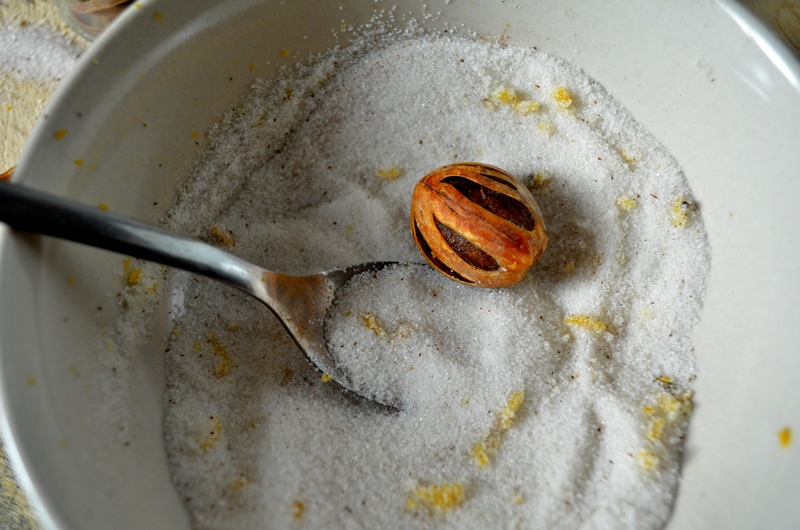 Meanwhile make your flavoured sugar by mixing the sugar, spices, zest and vanilla seeds together in a bowl or smashing them up in a Flavour Shaker. Put aside for later. When the dough has doubled in size, knock it back (you punch out some of the air so it can rise again later – this way your doughnuts will be light and fluffy). On a floured surface roll the dough out until it’s an even 1cm/½ inch thickness. Using a little cutter or a small glass (approx.5cm/2 inches in diameter) cut out about 25 circles and place them on a greased baking tray to rise again (make sure there is sufficient gap between each one to allow them to spread). Cover with the damp cloth and allow to rise for 45 minutes. When the blobs of dough have doubled in size again, use a chopstick to make a little hole in the centre of each doughnut. Now they are ready to be fried. Carefully heat the vegetable oil in a large deep frying pan (test the temperature by putting a small piece of dough into the oil – if it sizzles and turns golden brown after one minute the oil is at the right temperature). 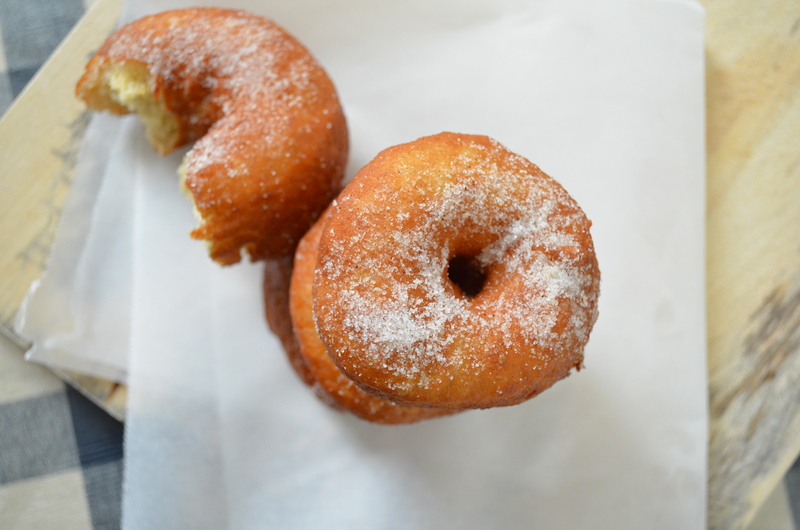 Fry the doughnuts in batches. After about 2 minutes, when they are golden brown carefully lift them out with a slotted spoon and place them on some kitchen paper to drain. 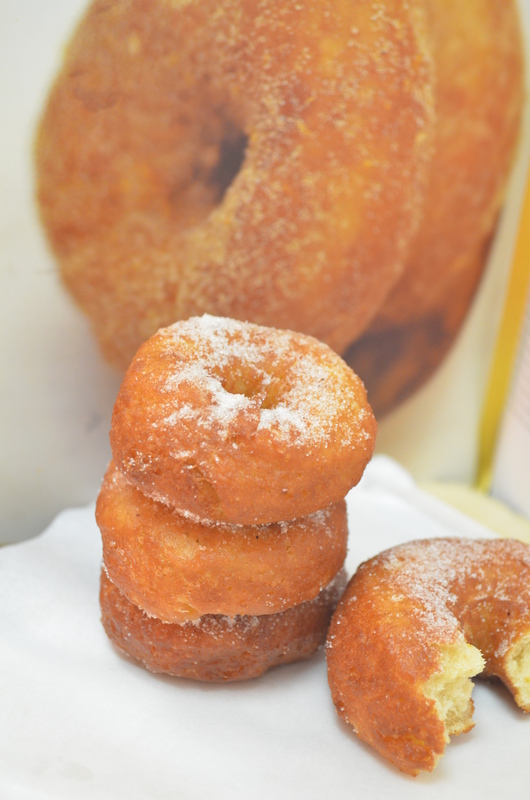 While your doughnuts are still piping hot, sprinkle over the flavoured sugar. Lovely eaten warm and eat them all in one go because they don’t keep very long. 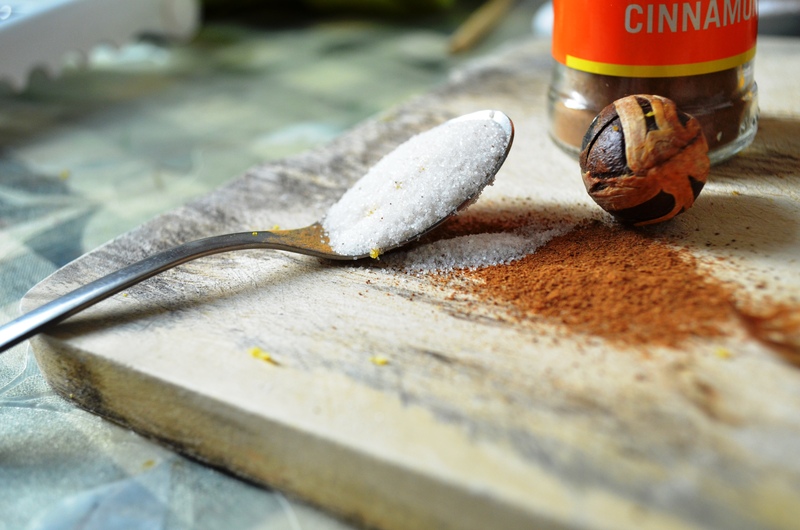 This entry was posted in Baking, Desserts and tagged Cook with Jamie, Doughnut, Jamie Oliver, Spiced Sugar. Bookmark the permalink. Ever so nicely written! Makes me want to make some too!! !